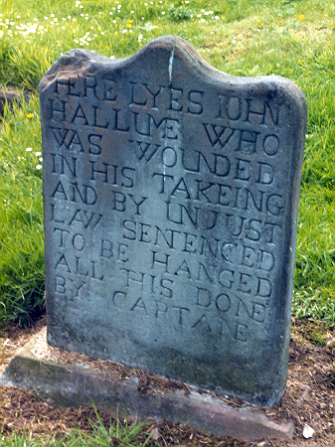 Lieutenant Livingstone was travelling along a road when he came upon the eighteen-year-old John Hallume (or Hall). He was shot at and struck with a sword. He was then taken to Kirkcudbright and tried. He was offered the Abjuration Oath, but refused. He was executed in Kirkcudbright in 1685.